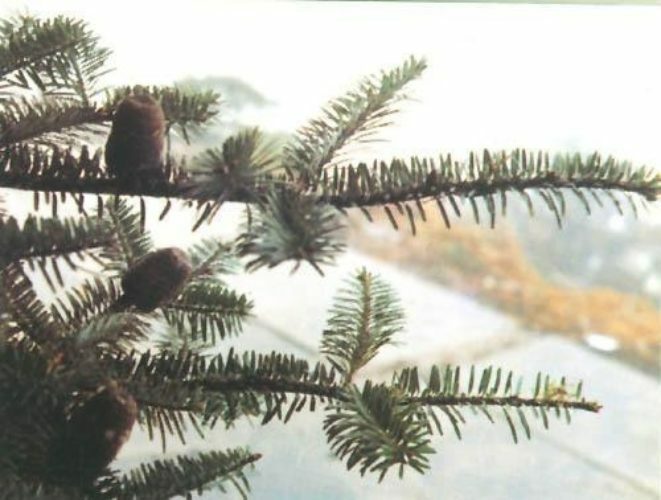 Abies fanjingshanensis, first described by W.L. Huang, Tu and Fang in 1984 is commonly known as Fanjingshan fir or 梵净山冷杉 (fanjingshan lengshan) in the Chinese language. It is synonymous with Abies fargesii var. fanjingshanensis. Description. Fanjingshan fir is an evergreen coniferous tree which will grow to a mature height of 60 feet (20 m tall) with a 26 inch (65 cm) diameter at breast height. Its bark is dark gray. Branchlets are red-brown, darkening in their 2nd or 3rd year. Leaves spread radially or ascend on upper sides of branchlets, and are 0.4 to 1.75 inches (1 - 4.3 cm) long and 0.08 to 0.12 inch (2 - 3 mm) wide with stomata in 2 bands on lower side of leaves. Seed cones are shortly pedunculate, purple-brown, ripening dark brown, cylindrical, 2 to 2.5 inches (5 - 6 cm) long by ca. 1.6 inches (4 cm) broad. Seeds are slightly appressed, narrowly ovoid, ca. 0.3 inch (8 mm) in size with a ca. 0.28 inch (7 mm) broadly-cuneate wing. Distribution. This species is native to China — northeastern Guizhou, and Jiangkou Xian provinces on the northern slopes of Fanjing Shan (Wuling Shan). This location is at least 310 miles (500 km) to the south of the nearest occurrence of Abies fargesii in the northwestern part of Hubei province. It is found at 6,700 to 7,500 feet (2,100 - 2,350 m) of elevation as a minor component of mixed conifer-hardwood forest. According to a Conifer Specialist Group study in 1998, the entire population is estimated to number less than 250 trees. However, the area is relatively inaccessible and no immediate threats are apparent. Abies fanjingshanensis — detail of foliage and seed cones.